"I've really enjoyed getting to know various booksellers during the pre-publication of this book, and I am a huge fan of independent bookstores. As the mother of small children, I rely on local bookstores (at home and on vacation) to provide not only access to books but also community--story hours, fun children's sections to visit on rainy days, interesting readings and panels to get me, and everyone else who attends, to think about the wider world than the one right under our noses. I feel that independent bookstores are really the purveyors and gardeners of the life of the mind." The Amazon Books store that's opening tomorrow in Chicago's Lakeview neighborhood is different in several ways from most of its four predecessors. As the Chicago Tribune noted, the new books and electronics store is the first in the Midwest; the first that's not in a mall; and the first with outdoor seating. It's also the second Amazon Books with a coffee shop, which in this case serves Stumptown Coffee Roasters brews. The 6,000-square-foot store will stock some 3,800 titles. Lynn Mooney, co-owner of Women & Children First, told the Tribune, "Of course we're concerned, but we also feel that all we can do is be our best selves and be creative and nimble. The personal touch, having a real professional bookselling staff, is going to be one of our greatest strengths." Katharine Solheim, a buyer at Unabridged Bookstore, added, "I can't pretend it's not on our radar, but our focus is on being the best booksellers we can be." Gary Robson at This House of Books' opening. Gary Robson, who was CEO and general manager of This House of Books, which opened last September in Billings, Mont., has been let go by the cooperative bookstore, KTVQ reported. Gwen Gunn, manager of the store's newly opened tea bar, has also left. Robson and Gunn plan to open a tea store in Red Lodge, where Robson had owned Red Lodge Books and Tea, whose assets the cooperative purchased last year when it hired him to run the store. At the same time, Gustavo Belotta has been promoted to general manager of This House of Books, and Jamie Winter is manager of the tea bar. Belotta has worked at This House of Books since it opened and earlier worked for 16 years at the now-defunct Hastings store in Billings, 13 years as manager. A member of the cooperative's board of directors told KTVQ that sales had been very slow in January and February and that "we definitely need to sell more shares and increase sales." Robson said that he and Gunn have not been paid "in some time" and said about his departure only, "This was the culmination of ongoing discussions dating back to early February." He added that he was "surprised by the seasonality of sales in Billings, and foot traffic in downtown Billings was less than Red Lodge." Belotta said he hopes to draw more customers with "as many events as we can get in here," including readings, signings and book club meetings, in addition to the game night held every Thursday. At Hastings, he stocked books by local writers and hosted events for them, which he also plans to do at This House of Books. Derek Walcott, the Caribbean poet and playwright who won the Nobel Prize for Literature in 1992, died last Friday. He was 87. The New York Times said that Walcott's "intricately metaphorical poetry captured the physical beauty of the Caribbean, the harsh legacy of colonialism and the complexities of living and writing in two cultural worlds.... [Walcott's] expansive universe revolved around a tiny sun, the island of St. Lucia. Its opulent vegetation, blinding white beaches and tangled multicultural heritage inspired, in its most famous literary son, an ambitious body of work that seemingly embraced every poetic form, from the short lyric to the epic." Among those works were Omeros, the Homeric epic poem considered by many to be his masterpiece; In a Green Night: Poems 1948-1960; and the play Dream on Monkey Mountain, which won an Obie. He was also a painter and watercolorist, whose pieces illustrated some of his work, and received a MacArthur Foundation "genius" award. While many attendees believed beforehand that Brexit and the new administration in Washington might overshadow the event, last week's London Book Fair was a busy, energetic, refreshing gathering. The trade show floor was crowded as soon as it opened, and that pace continue through until Thursday's closing. Politics was a frequent topic, but it didn't dominate the event. Some attendees had also worried about the effect of the fair's move to mid-March from its usual April time, but that concern quickly dissipated--and the move was greeted so positively that several American exhibitors were hoping that the fair will continue to be held in March because of its timing just before the spring season begins and its distance from BookExpo. (In fact, the show returns to April next year.) Mild March weather in London probably helped significantly. 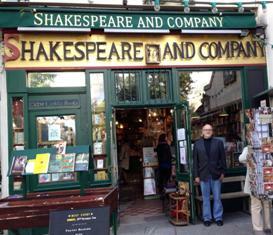 The Bookstore of the Year Award, part of the London Book Fair International Excellence Awards and sponsored by Gardners, was won by Shakespeare and Company in Paris. The store was cited for "the way it has endeavoured to become a 21st century bookseller. It has opened a café, expanded its children's section and revamped its website to include the introduction of online purchasing. Its extensive events programme is now brought to people around the world via video and audio podcasts." During a panel about the future of British comics, the discussion turned to the decline of newsstands and what comic book publishers have done to replace the role they played in the discoverability and accessibility of comics. Ben Smith, head of books and comics publishing at Rebellion Publishing, said that while newsstands and sales of single issue comics have declined, the graphic novel format has "exploded in the book trade," and bookstores are "essential" now for reaching new readers. Mike Stirling of Beano Studios agreed that "the bookshop is a wonderful opportunity for comics," adding that bookshops and comic shops provide a level of "care, attention and order" that is beyond what other physical retailers provide. Kieron Gillen, writer and creator of The Wicked + The Divine, said that in a way, monthly single-issue comics have become "loss leaders for our collections" that are published periodically in graphic novel format. He also identified two audiences for comic books: those who follow each issue month to month and those who buy the periodicals every six months or so. Gillen noted that both audiences are essential for a successful comic book, but the latter audience is larger. 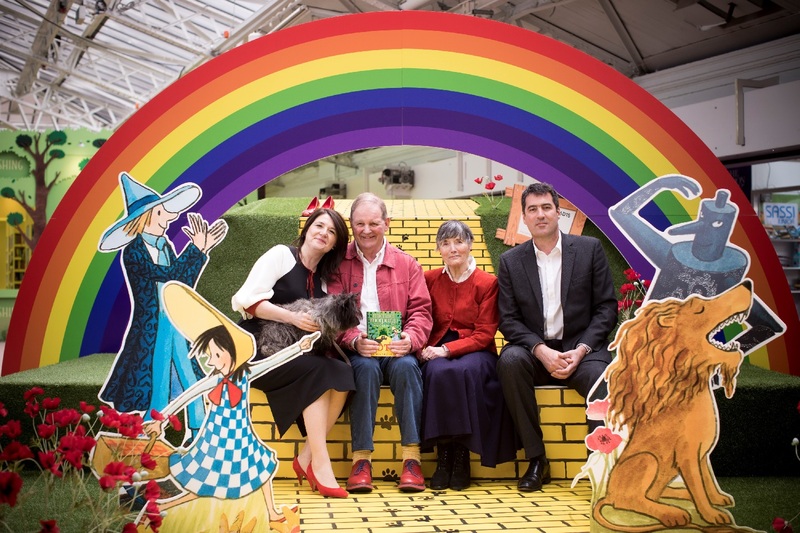 At LBF: HarperCollins Children's Books executive publisher Ann-Janine Murtagh; Michael Morpurgo, who will write Toto, a retelling of The Wonderful Wizard of Oz; Clare Morpurgo; and HarperCollins UK CEO Charlie Redmayne. In a Booksellers Association panel about creating inclusive bookshops, author Nikesh Shukla (Coconut Unlimited; Meatspace) identified what he called the "loop-the-loop" of blame that goes on in publishing while discussing inclusivity and diversity. Shukla said it begins with writers and people of color looking at the shelves in bookshops and review coverage in magazines and literary prize lists and not seeing themselves represented, and eventually thinking "well, I guess this industry is not for me." Literary agents, meanwhile, take the best of what they see and are so busy that they don't take the time to search out good writers from underrepresented demographics. Publishers then buy from what the agents pitch them, and everyone else reviews and shelves and lists from what publishers put out. Even more writers then look at store shelves and don't see themselves represented, and the "loop goes round and round." Shukla said he wanted to help "break the loop." In the same panel, John Newman, a bookseller at Newham Bookshop in London's East End, recalled spending "a long time challenging a racist portion of the population in Newham." Newham Bookshop has been operating since the late 1970s in the East End, the community has seen waves of immigration over the years. While the bookshop itself embraces the diversity of the neighborhood, there are those in the community who have pushed back against it. Former residents sometimes return to visit and say things like "don't you think it's changed around here for the worst? You say no," said Newman. "You don't come back with what they think you'll say." During a BA panel about best practices for using social media, bookstore owner Katie Clapham offered some examples of what not to do with a bookstore's social media account. She mentioned a bookseller in the north of England (who has since gone out of business) who would tweet directly at authors wondering why they weren't doing events in his shop in a way that was "very direct and completely inappropriate." He would get into arguments with authors and publishers, "slate" his customers about not shopping at the store enough and "name and shame" the town over its perceived lack of support. 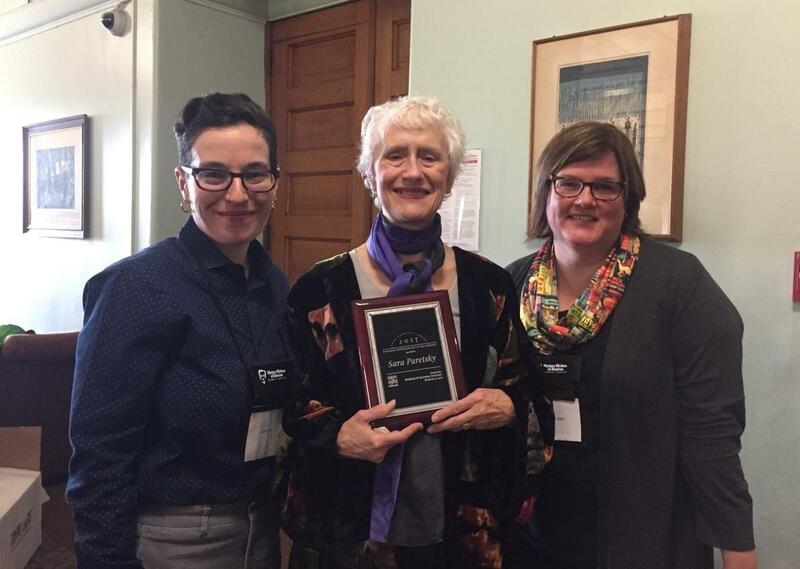 Author Sara Paretsky (middle) was presented with the inaugural Paretsky Award at Murder and Mayhem in Chicago a week ago. The award, which will be given annually at the conference, honors Midwest mysteries and the achievement of their authors. The award was presented by event co-chairs Dana Kaye (l.) and Lori Rader-Day (r.). Happy 20th Birthday, Book Culture! Congratulations to Book Culture, with three stores in New York City, which is celebrating its 20th anniversary next week. Birthday events include a panel discussion on Monday, March 27, on academic publishing over the past 20 years, featuring Jennifer Crewe, Fredric Nachbaur and Ellen Adler; and the "marquee event," a party on Friday, March 31, that will feature "drinks, brief speeches and good cheer!" Besides marking the bookstore's birthday, it celebrates the launch of Book Culture's New Directions section, featuring most of the publisher's catalogue. The store explained: "Over our 20 years at 536 West 112th Street, Book Culture has seen many changes in the bookselling and publishing world. In the time, NDP has remained one of our favorite presses." "Help! Booksellers trapped inside on a beautiful day! 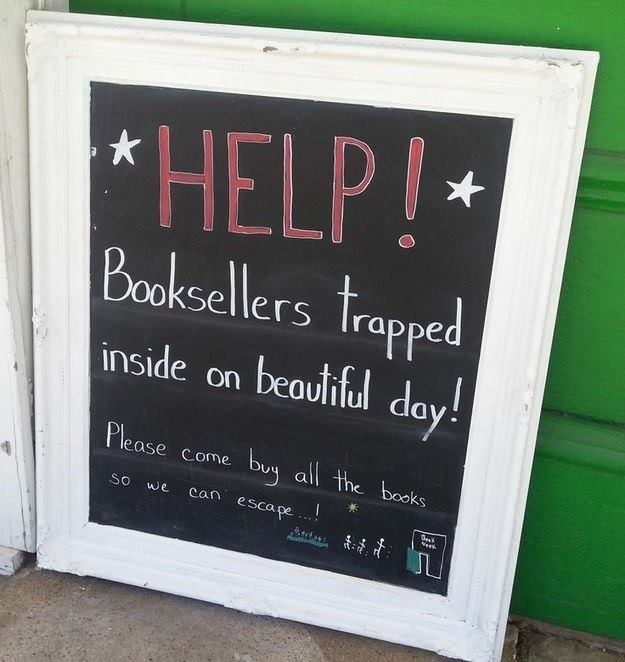 Please come buy all the books so we can escape!" read a chalkboard sign at Seattle Mystery Bookshop, which posted on Facebook: "It's sunny in Seattle! And it won't last!" Rebecca Marsh is joining Viking/Penguin Books as publicity manager. She has been a senior publicist at the Crown Publishing Group for Crown Archetype, Harmony, and Three Rivers Press. Earlier she was at Simon & Schuster. Jill Hacking has joined the company as a marketing and publicity assistant. She was previously an intern at Norton. Samantha Benson has joined the company as a publicity assistant. She was formerly an intern at Bloomsbury Children's and was a bookseller at Barnes & Noble. The Legend of the Albino Farm by Steve Yates (Unbridled Books). 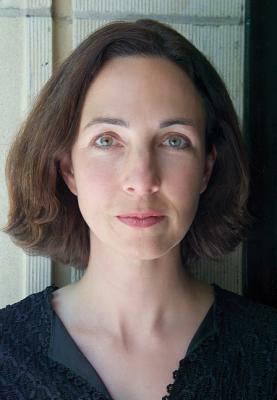 Yates is the associate director and marketing director at the University Press of Mississippi and won the Knickerbocker Prize for Sandy and Wayne: A Novella and the Juniper Prize for Some Kinds of Love: Stories. CBS This Morning: Alyssa Mastromonaco, co-author of Who Thought This Was a Good Idea? : And Other Questions You Should Have Answers to When You Work in the White House (Twelve, $27, 9781455588220). Fresh Air: Ron Powers, author of No One Cares About Crazy People: The Chaos and Heartbreak of Mental Health in America (Hachette Books, $28, 9780316341172). Tavis Smiley: Erica Armstrong Dunbar, author of Never Caught: The Washingtons' Relentless Pursuit of Their Runaway Slave, Ona Judge (Atria/37 INK, $26, 9781501126390). Dr. Oz: JJ Smith, author of Green Smoothies for Life (Atria, $19.99, 9781501100659). Daily Show: Bassem Youssef, author of Revolution for Dummies: Laughing through the Arab Spring (Dey Street, $26.99, 9780062446893). Late Night with Seth Meyers: Chris Hayes, author of A Colony in a Nation (Norton, $26.95, 9780393254228). ABC's Nightline: Katey Sagal, author of Grace Notes: My Recollections (Gallery, $26, 9781476796710). Last Call with Carson Daly: Jay Chandrasekhar, author of Mustache Shenanigans: Making Super Troopers and Other Adventures in Comedy (Dutton, $27, 9781101985236). He will also appear tomorrow on Comedy Central's At Midnight. The Talk: Lily Collins, author of Unfiltered: No Shame, No Regrets, Just Me (HarperCollins, $18.99, 9780062473011). 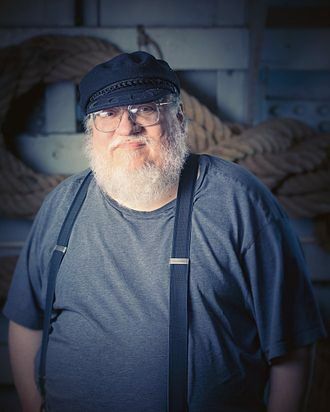 A Song of Ice and Fire series author George R.R. Martin is launching the Stagecoach Foundation, a "30,000-square-foot nonprofit office and production facility that will be open to both major Hollywood productions and beginning film entrepreneurs," in Santa Fe, N.Mex., the Albuquerque Journal reported. The building was donated to Martin, who lives in Santa Fe and also owns the Jean Cocteau Cinema. "What this means for the city specifically is more film infrastructure," said Santa Fe mayor Javier Gonzales. "As a foundation and a nonprofit, his [Martin's] vision is to make this facility accessible and affordable" so film and digital artists will have a space "where they can go and create." Joel and Ethan Coen, who filmed No Country for Old Men in New Mexico, are expected to use the Stagecoach Foundation space, according to the mayor, who tweeted: "Giant step forward for our film economy today as we welcomed @GRRM Stagecoach Foundation production facilities. First up Cohen Bros!" Jacob Ross has won the inaugural £1,000 (about $1,240) Jhalak Prize for Book of the Year by a Writer of Colour for The Bone Readers (Peepal Tree). One of the judges, Musa Okwonga, described the work of crime fiction as "by turns thrilling, visceral and meditative, and always cinematic." The book is the first in the Camaho Quartet and is set on the small Caribbean island of Camaho. Since Noor Yadegar was sent from her homeland of Iran to the U.S. as a teenager, she's missed her father, Zod, and their family's café--a neighborhood institution. After discovering her husband's infidelity, Noor heads back to her family's home in Tehran with her teenage daughter, Lily, in tow. The world they discover is both familiar and unknown to Noor and totally new to Lily. 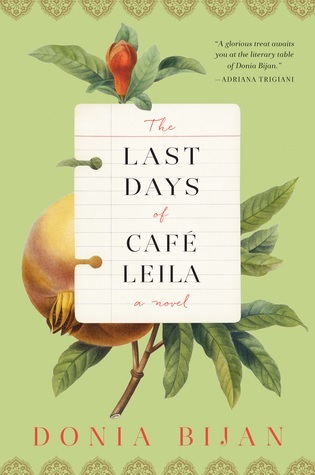 Iranian American chef and writer Donia Bijan--who also came to the U.S. as a teenager--paints a rich portrait of family, food, love and loss in her debut novel, The Last Days of Café Leila. Bijan (the memoir Maman's Homesick Pie) alternates among the perspectives of three generations: Zod, firmly rooted in the house and restaurant established by his parents, Russian immigrants who taught themselves to cook Persian food; Noor, caught between her painful past and an uncertain future; and Lily, reluctantly learning to navigate an unfamiliar culture and the extended family she has never known. Bijan evokes the loneliness of leaving and being left behind as she recounts Noor's college years in California and Zod's endless patient waiting for her letters. Ever-present in both their minds is the shadow of Noor's mother, Pari, a beautiful opera singer who was murdered by the Islamist regime. Although Noor came to Tehran hoping to escape her heartbreak, she must deal with the weight of her family's history and the realities of life in Iran, harsh and beautiful, gracious and violent. When Lily convinces Karim, the café's errand boy, to join her in a daring escapade, the resulting events will have consequences for the entire Yadegar household: Noor, Zod and the café's small staff of loyal employees. Meanwhile, Noor must confront her father's mortality and decide how she wants to shape her own future. Shelf Talker: In her debut novel, Iranian American chef and writer Donia Bijan stirs up a powerful, nourishing story of family, love and loss.